There’s always that one obstacle, isn’t there? That one obstruction on the road that would otherwise have made an uneventful trip. That one wall to jump over before reaching the finish line. That one last gasp of air you simply must take before swimming to the other side of the pool. How dare the person or circumstance that created this obstacle do so to shake you out of your complacency! The nerve of them to pull you out of your comfort zone so as to make you reconsider all you thought sacrosanct! And who the hell are they to judge you simply because you – who longs for a break from the usual – fail to see the irony of having your wish fulfilled? What did this have to be the essence of drama? And why did my obstacle have to be a 9-year-old girl? When I was selected to be a writer for this year’s Olympians Fest, I was surprised that my chosen proposal was – for lack of a better term – the least ambitious; not just for this year’s roster, but for all the proposals I’d submitted. When writers are invited to submit proposals for the festival, there’s no limit placed on the number of proposals or subjects: one can opt for a straightforward, traditional retelling of their Greek God’s myth, or – as is more often the case – you can dress it up in fancy new clothing. Of the 24 gods being covered this year, I submitted about six proposals they ranged from Grimm-like faerie tale to ‘60s spy film parody to biblical sci-fi epic to a good old fashioned horror story. Which one got picked? The one with the three people talking. Seriously. My other proposals were shameless genre fare, but the one I wrote for the disgraced god Atlas was pretty much a Richard Linklater script where everyone is named after Greek mythological figures. What’s been rewarding about taking on this “unambitious” piece is that I find it much more challenging than if I’d won with one of my more outlandish proposals. The reason for that is because this story is the most personal. Set in the Northern California of 1995, the piece draws a great deal from my life at that time and place. So much so that revisiting the person I was then makes me uncomfortable. But it’s forced me to come to terms with the person I was then and how it’s affected the person I am now. As such, the character more-or-less based on me, Herc, has been relatively easy to write. So too have I had little trouble writing Mr. A, the guilty Catholic Super-Ego of the piece. No dear reader, the obstacle has come in the form of trying to write the play’s third character: Callie, my modern interpretation of the mythical Calypso. For those not familiar: Calypso was an important character in The Odyssey, Homer’s epic poem of life after the Trojan War. Odysseus, King of Ithaca, is trying to return home to his queen, but is sidetracked by ten years’ worth of obstacles. One of those includes his ship crashing on the island of Ogygia, home of the nymph Calypso. She nurses him back to health, but seduces and “traps” him on the island to be her lover. Her plans are foiled by Athena, who sends Hermes to intervene. 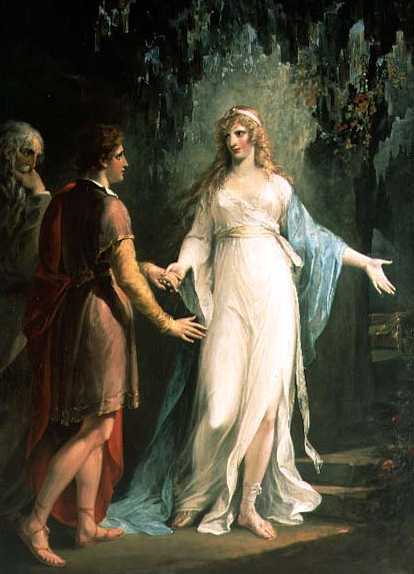 Not wanting to invoke the wrath of Zeus, to whom Hermes was messenger, Calypso reluctantly lets Odysseus free. His departure leaves her so heartbroken that she kills herself. As there are so many academic and artistic sources from which to glean interpretation, I won’t go into them here. Two friends, one a fellow Olympians writer, have recommended to me Rick Riordan’s Percy Jackson and The Olympians books, in which she reportedly plays a major role. For the record: I understand the “obstacle” nature of Calypso’s existence in that it’s Odysseus’ story and he is deterred just as easily by pleasure as danger. Having said that, I’m empathetic to Calypso because when a woman’s been stuck on an island for as long as she (remember, she’s immortal), can you blame her for getting more-than-a-little attached to her new companion (to say nothing of Hesiod’s Theogony which claims that their consummated relationship produced offspring)? This is the heartbroken woman watching her love sail away in that Suzanne Vega song. Originally I had no plans of adding a Calypso equivalent to my play. Based on “The Twelve Labours of Heracles”, my play is inspired by the eleventh and penultimate task: steal Hera’s golden apples. He does this with the assistance of the Titan Atlas, who is living out his post Titanomachy penance of holding up the heavens themselves. It was very simple for me to turn the battle-weary Atlas into the Vietnam War veteran Mr. A and the demigod Heracles into the bi-racial teen Herc. I thought the generation gap between these two would be enough to hold interest for a full hour. But something wasn’t working. I may have mentioned this before, but I have a bit of an obsession with the Freudian model of the human psyche. Mr. A’s unshakeable traditional mores made him a perfect Super-Ego, but I’d always seen Herc’s age, even-temperedness, and multi-ethnicity as my subconscious telling me that he was an Ego negotiating between impulses. I needed an Id. Since it was already a two-man sausage-fest, I felt adding in a female character would appropriately shake things up; and Atlas’ abundant progeny gave me no shortage of ladies from which to choose. I first considered one of the Hesperides, as it’s their garden in which Hera’s apple tree is located, but was unable to settle on one. Choosing from the nine Hyades or the seven Pleiades proved equally frustrating. This left his post-marital offspring, including Dione and Maera. I tried not to make the obvious choice, but in the end I, like Odysseus before me, found myself gravitating towards the nymph-goddess of Ogygia. And like that, Mr. A had a nine-and-a-half-year-old daughter named Callie. Her island is Mr. A’s house; as Calypso’s mother was never named, neither is that of Callie; her uncontrollable affection is – for now – directed towards Herc. I don’t think I can overemphasise what a relief it was to add her to the script. I’d always intended for the play to be clash between the personalities of Mr. A and Herc, but I couldn’t come up with any good reason for them to connect. I mean, they’re stuck with one another all day, it only stands to reason that they’ll connect or kill one another, right? Well, whereas Calypso was an obstacle in Odysseus’ quest, Callie has a bridge in having the two men speak to one another in a civilised manner. Admittedly, it was tough trying to think of something for her to actually, y’know, do. Herc is fixing up the front porch and Mr. A has all manner things he needs to finish, but I kept asking myself “What the hell is Callie’s motivation for constantly showing up? Yes, I need her character in this scene, but why does she just happen to walk in at the most convenient moments?” A writer must ask him/herself these questions in advance, because they will most certainly be asked by the directors, crewmembers, actors, and audience members. At this point, she was basically one of the faeries from The Legend of Zelda. I finally found a use for her by remembering the time in which the play is set. I’ve set it in the summer of 1995, an important transitional time in American history; one that I feel has gone unrecognized and unappreciated in the years that followed. Having already established that she has a crush on Herc (unbeknownst to him), I just decided that her main purpose for reappearing would be her playing detective. She’s gathering information that she plans on using to create gift for her would-be beau – one that, I’ll admit, allows me to have a lot of fun with 1995 pop culture references. One of my steadfast rules for this script has been to “lock” the date as Monday, 3 July 1995, with no anachronisms or forced references. I want the characters to live in the moment, with no prevision of events yet to come or people they’ve yet to meet. And that actually makes me a little sad, because I can’t help but think that Callie’s destiny is to be that of her mythical predecessor. She’s absolutely smitten with a boy who won’t – nay, can’t – reciprocate the sentiment and when she eventually realises that, she’ll be crushed. Everyone remembers the first time they gave their heart to someone, only for the someone to light the heart on fire and toss it out of a window. Callie will probably think of Herc as the first boy who didn’t love her back. And she still has her Odysseus to come; the boy who will break her heart so completely that she may never recover. There’s a cliché about writers thinking of their characters as their own children. In that regard, it’s adorable to watch Callie have her first crush, but it kills me to know that she has disappointment in store. But I digress – if and when that happens, it would be after the events in this play. In creating these characters I put a great deal of myself into each of them. Such is not only the appeal of writing for this festival, but with exploring Greek mythology itself: no matter how fantastic the circumstances of each story, the characters are all so wonderfully human that we can easily put ourselves in their winged shoes without taking any great leaps in logic. They’re ambitious, envious, anger-prone, insecure, and horny. Very, very horny. And that’s why I care so much about Calypso: calling her “whore” or “brat” isn’t fair; calling her “heroine” or “Florence Nightingale” would be equally myopic. She was angry, she was loving, she was lonely, she was loyal.